Kim Little scored a second half penalty to give Scotland a lifeline in their World Cup playoff. Scotland have it all to do after losing 2-1 to Holland in the first leg of their Women's World Cup play-off semi-final at Tynecastle. Lieke Martens gave an impressive Dutch side the lead after 10 minutes when she sidefooted the ball past Gemma Fay after the Scotland goalkeeper parried a long-range shot from Vivianne Miedema. The visitors doubled their lead in the 23rd minute when Manon Melis scored with a penalty awarded for an infringement in the box by Frankie Brown on Miedema. Only a fine save by Fay when she denied Melis from close range prevented the home side going further behind by the interval. Anna Signeul's home side came out determined to make amends at the start of the second half and in the 49th minute they got a lifeline when they were awarded a penalty by Ukrainian referee Kateryna Monzul after Stefanie van der Gragt handled Brown's cross into the box. Kim Little slammed the ball low into the corner of the net past Loes Geurts and suddenly Scotland were back in the game. The Dutch goalkeeper then made a superb save from a Jenny Beattie header following a Jane Ross free-kick but the visitors withstood the pressure, slowly composed themselves and again began to threaten. As Scotland pressed for the leveller in the dying embers of the game, Melis galloped clear of the home defence, only to strike the post with her shot. That left the Scots with only a one-goal deficit for the return game in Rotterdam on Thursday. 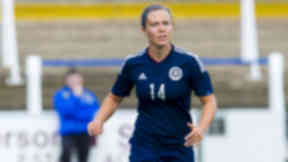 Little believes her goal was crucial to keeping Scotland in with a chance of facing either Italy or Ukraine in the play-off final. She told BBC Alba: "We weren't very pleased with the first half but we showed what we could do in the second half and we pushed for the second goal. "We are only one goal behind so we will go into the second leg very positive. "With their two away goals it was a must that we got a goal and I am glad we did, we needed that going into the next game." Ross said: "It was disappointing to lose the game and to concede two goals at home, we were obviously looking for a better performance. "We can't get away with starting games like that or we are going to be punished."